Toca Blocks allows you to design your own worlds by combining blocks and discovering new interactions among them. It has been more than two years since Toca Boca released one of my favorite games for kids: Toca Builders. Being able to create my own imaginative world with a combination of six well-designed characters with different roles and abilities is truly awesome. I believe it’s the best construction game for kids, ever. Today marks another historical date in the iPad games for kids space: Toca Boca released a brand new game called Toca Blocks. It doesn’t use 3D isometric like Toca Builders, but it offers more flexibility to create all sorts of imaginative worlds. In fact, you can create huge 2D worlds that go up to outer space. The main idea of Toca Blocks is for you to create your own worlds by applying blocks to create 2D structures. You start with a huge empty world, consisting of a huge grass field that extends up to outer space. You also get four basic building blocks: the polkadot brick, the yellow brick, the red brick, and the green grass. Each of the new block types has its own unique characteristics. For example, a black warp will allow you to teleport to another black warp. A bouncy block is just that — bouncy, whereas a sticky block will freeze any hero that walks over it until they jump. A fragile rock will break apart if stepped on too long, but it will restore itself after a few seconds. There are plenty of other block combinations that you can explore and build your worlds with. Make sure you check out the complete blocks combination guide I assembled below. You can also try placing a magic door into your world. If your hero enters the door, you will be taken into a new world with different types of building blocks. In Toca Blocks, you can switch between two modes: the design mode and the play mode. In the design mode, you navigate the world using the big ball on the bottom toolbar, or by tapping on an empty space and dragging the screen. In addition to adding new blocks into your world, you can remove a block by double tapping on it. To move a block, simply tap and drag it anywhere. If you drag a block on top of another, you’re combining them. If you make the right combination, you may get to discover/unlock a new block type. Note that you can combine two blocks of the same type, but it won’t yield anything — the block you moved will simply leave an empty space in its place. Once you have unlocked a non-basic block type, you can access them from the side toolbar. This is very helpful, especially considering how some of the block types are really complex to create. When trying to add many blocks at one time, consider using the painter tool to do the job quickly. First, tap the block that you want to use. Then, tap the painter icon and start drawing. Conversely, you can erase many blocks by using the black flying monster tool, which will eat the blocks it touches. In the play mode, the control is a bit different. First, you need to identify which hero you want to control. You can either tap the hero — if she’s on screen — or tap the hero finder icon on the top right corner. When you tap a hero or the hero finder icon, you will be switched to the play mode automatically. To control the movement of your hero, you can use the left/right direction buttons and the action button on the bottom of the screen. If you can’t reach the action button with your thumbs, you can drag the button to a more accessible position. Toca Blocks has three heroes with three different characteristics and abilities. Toca Blocks has three heroes that you can play with. The first is the green bird, who has a normal speed and a normal jumping height/distance. The second is the more agile black cat, who can move faster and jump higher/farther. The third one is the red bear, who is the biggest but the least agile of them all. A unique thing about these heroes is they can interact differently with their environment. For example, the red bear may not be able to jump high, but he can climb walls and hang onto ceilings. Meanwhile, the green bird can destroy a stack of two building blocks that stand in its way. Using the magic doors, you can move from the main world into the parallel world, and vice versa. When you’re designing or playing with Toca Blocks, the game will automatically save your progress. If, for any reason, you need to leave the game, you can return later and your world will stay the same. 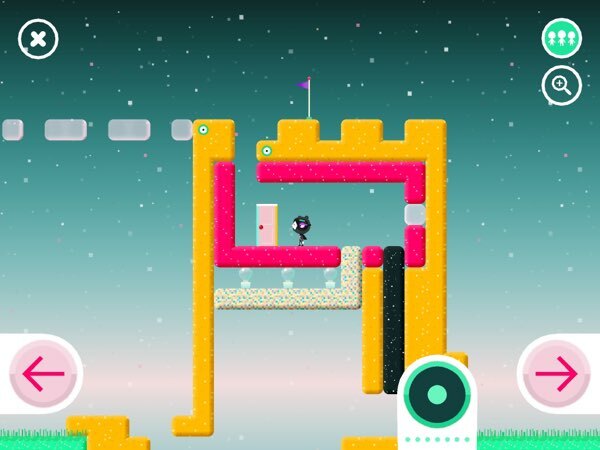 Toca Blocks supports the creation of multiple worlds. Note that in each new world you’re starting from scratch — you don’t get to bring along all the unlocked blocks from the other worlds. I find the game suitable to kids ages 6+. If they’ve played with Toca Builders, Minecraft, or Super Mario Maker, they’d find Toca Blocks relatively intuitive to play with. Toca Blocks works great without an Internet connection. It doesn’t have third-party ads, in-app purchases, or links to social networks. Please keep in mind that Toca Blocks requires iOS 8.0 or higher. There are plenty of things that you can do once you have unlocked most of the block types. One of them is trying to mimic the world 1-1 from Super Mario Bros.
Philip and I really like the ability to combine blocks in the game. We spent many hours just trying out many different blocks combination to discover new types. There are some really complex combinations that require precise sequences. For example, if you want to create a flying engine — similar to one you’d find in a small airplane — you’d need to combine four blocks in the following order: polkadot + yellow + polkadot + yellow. Another fun detail is how you can interact with some blocks. For example, tapping on a bomb will blow up all the adjacent blocks, and tapping on a toilet will cause it to flush itself. Toca Blocks has plenty of block types that you can unlock by combining different blocks. Here are some of the ones I've found. I’m using my own naming convention for this guide. Please feel free to contact me via Twitter if you have better names for them. For starters, this is how I name the four basic blocks (from left to right): polkadot, yellow, red, and green. Here are the new block types that you can unlock by combining three basic blocks. You can only switch the order of the first two blocks. You can’t just combine the three blocks arbitrarily. Note: There are three types of trees that you can unlock. Try the Polkadot + Green + Green several times to unlock them all. Here are the new block types that you can unlock by combining two non-basic blocks. And, these are the more complex ones that I also found. If you have more of these, I’d love to know them too. I’ve never played Minecraft nor Super Mario Maker, but Toca Blocks looks like a fun combination of the two. Similar to crafting in Minecraft, we can combine blocks to discover new types. Then, we can use these blocks to create our own worlds — just like in Super Mario Maker. If your kids love to create their own imaginative worlds, Toca Blocks is a must-have.